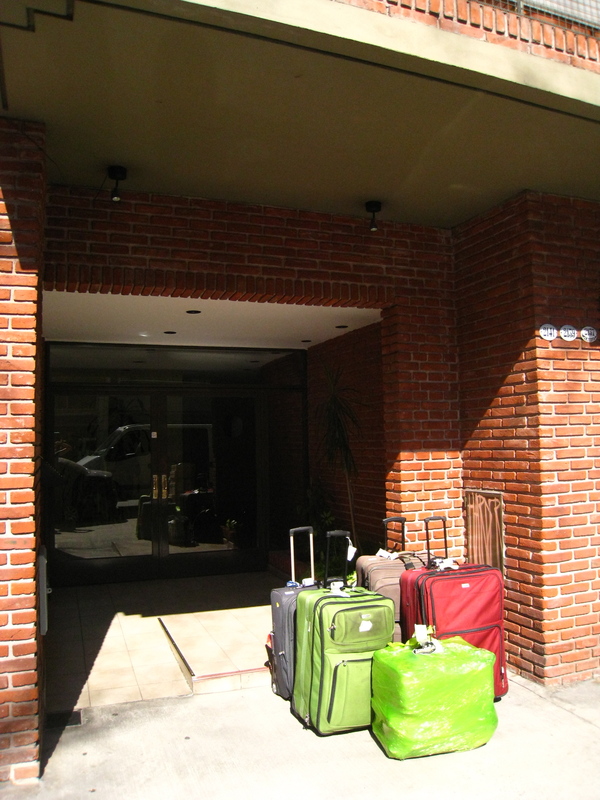 All our bags in front of our new apartment building. The bright green bag is our joint carry-ons. Our trip down to Buenos Aires went relatively smoothly. Flying on Tam is an interesting experience. While they have a generous 2 checked bag allowance (at ~70 lbs each) the fees should you exceed this are extreme. We each had two large rolling bags, one rolling carry-on, and a large backpack for our “personal item”. Nobody said moving to another country would be easy and truth be told I am not the lightest of packers. I blame it on my pack rat genes… However, this was, believe it or not, the first time in my life that a rolling cart was actually necessary. So there we were, luggage stacked high, passports in hand, awkwardly rolling our way to the Tam counter. As we approached the entrance to the line, the woman who checked our passports said (in Spanish, which I’m not completely comfortable with as yet) “You know the limit for a carry-on is 5kg?” We either thought we heard this wrong or we thought she was mistaken. 5kgs is about 10 pounds. The carry-on suitcase itself is about 5 pounds at least… Needless to say our carry-ons, as well as our personal items, were well over 5kgs. Conveniently just across from the check-in desk, there is actually a service that will sell you (at a ridiculous price, go capitalism) a large, flimsy bag with a zipper, which holds your two carry-ons and which is then wrapped in rolls and rolls of plastic wrap. I think the airlines have a stake in these companies… So 5 checked bags, many fees, and nearly running through the airport later, we finally made it onto the plane which took us the 8 hours to Rio de Janeiro and then, after a brief layover, 3 additional hours to Buenos Aires. We arrived in our new city to BEAUTIFUL weather and had a lovely drive from the airport to Palermo, our neighborhood for the month. ← Goodbye New York… Hello Buenos Aires!! How exciting! The couple seeking an apartment on the show wanted to live in Palermo SoHo — the area looked fantastic. Enjoy!! Your building looks so modern from the outside. I am sure it was a relief just to get there. Hope you had a elevator to get all that luggage upstairs! Enjoy your time there. Love you.